I traveled to the Build Boston Trade Show on Friday Nov. 20th, which was held at the Seaport World Trade Center on Boston’s waterfront. With more than 250 exhibits and over 200 workshops, there wasn’t enough time in the day to see it all. This show was a bit different than some that I have been to in the past, in that it had something to offer to anyone who is involved in designing, constructing, maintaining, or occupying a building. Whether you are a student, architect, engineer, contractor, or a homeowner this show had something for you. The organizers brought all aspects of building together under one roof; exhibitors ranged from building product manufacturers to renewable energy companies to educational institutions. I did get a chance to stop and talk with some of our suppliers who had booths in the trade show. Marvin, our window supplier, had a huge display of windows and doors that took up the space of about eight standard size booths. Our structural insulated panel manufacturer was there as well, showing off their EPS Foam Core Panels as well as their new “Fast Form” insulated concrete form line. Longfellow Cedar Shingles based in Windsor, Maine, caught my attention with a new MicroPro pressure treated cedar shingle which brings maintenance free to a whole new level. All in all I had a great experience and I would recommend this event next year to anyone who is thinking about or is in the process of building or renovating a home. As we travel to other trade shows across the country we'll report back on our findings and our experiences! 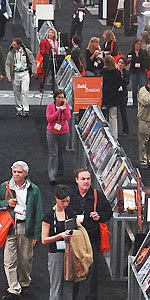 If you have a favorite trade show that you think we should attend please make a suggestion.